The savings continue on Black Friday! Use Coupon Code: BLACKFRIDAY to save another 10% on top of your 10% daily login discount for a total of 20% savings! Also, read our Newsletter to find out how to use Facebook and Twitter to add free merchandise to your holiday order! 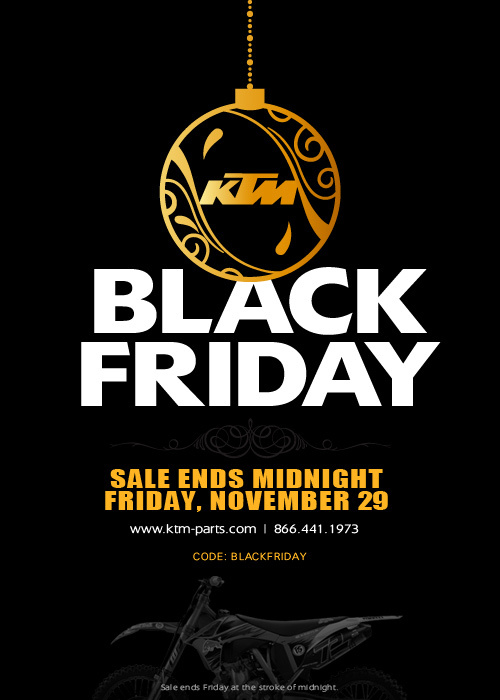 Watch for new editions of the ktm-parts.com Newletter throughout the weekend for information on exciting new products, gift ideas and sales promotions!